Over the last few years, Lauderdale County Schools has worked to increase opportunities for Early PostsSecondary Opportunities (EPSOs) for its high school students. 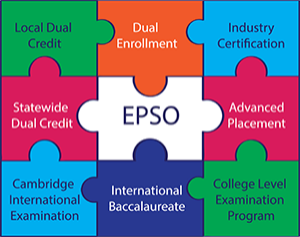 EPSOs include a course and/or exam that give students a chance to obtain postsecondary credit while still in high school. Our county also offers several programs of study at each high school that ends with the opportunity for the student to achieve an actual industry certification before graduation. Our students have an unprecedented opportunity to pursue education and training beyond high school through Tennessee Promise, a scholarship and mentoring program which provides high school seniors with two years of tuition-free attendance at a community or technical college in Tennessee. Early postsecondary opportunities ensure that students are ready to take full advantage of the Tennessee Promise and succeed in education and training after high school. Research has shown that students who participate in early postsecondary courses are more likely to enroll and persist in postsecondary environments. earn postsecondary credits while in high school. become familiar with postsecondary rigor and expectations. develop confidence and skills for success in postsecondary learning. make informed postsecondary and career decisions. decrease the time and cost of completing a certificate or degree. The ‘portfolio’ approach, in which a school offers two or more early postsecondary programs, helps ensure that college credit and/or a technical credential is accessible to all high school students. 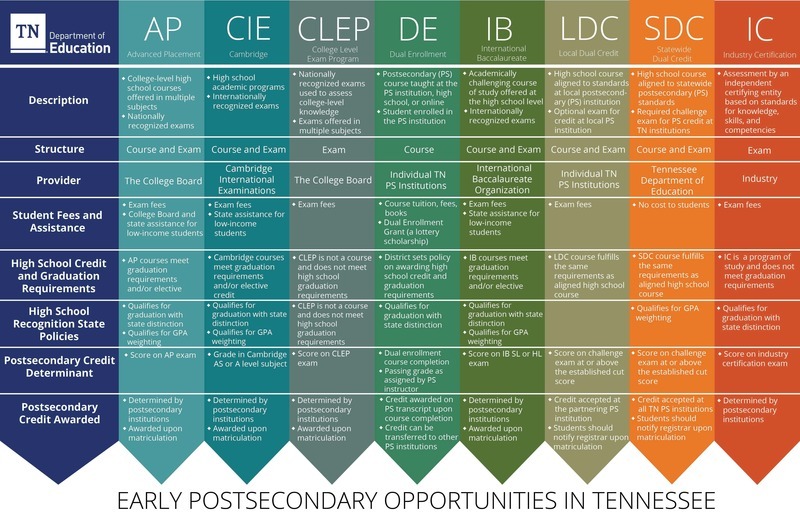 The eight opportunities offered in Tennessee appeal to diverse student interests, needs, postsecondary aspirations, and levels of prior academic performance. Information about all EPSOs recognized in TN are listed in the chart below.